Holy smokes, it's like a for real thing! 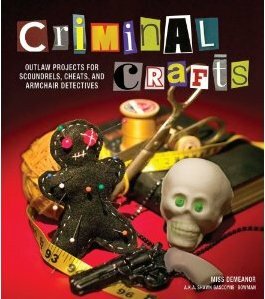 Criminal Crafts, the book is at the printer, getting boxed, bundled, and packed up for a shipment to stores this spring. While I knew that it was happening, since books don't write themselves, much as we'd like them too, it didn't feel legitimate. Until this ... The thing that's got me super giddy is the ISBN number, it seems so official, even more fun than when I found my name in the phone book for the 1st time. So even though the book isn't out yet, you could pre-order it, or wait a bit and let me sign a copy for you with a devious inscription. So delighted with how the project turned out, the folks at Andrews McMeel did an amazing job putting it together. The design elements are super charming in the macabre way that I find so appealing; faux bullet ridden holes in the pages, tire tracks from get-away cars and the occasional incriminating fingerprint. Laura and Rob have a great sense of humor so working on this project wasn't really a stretch. I'm super lucky to have such talented folks in my life, and grateful that my kids will actually have some folks who are a good influence on them as roll models. I mention this last bit because, last week my 8-year-old came running into the room yelling "mommy, I have a great idea for a bank job". As much as I'd like to discourage her aberrant behavior, it actually was a good plan, so if this whole book thing doesn't work out, we've got plan "B", though it does involve waiting until her brother is tall enough for his foot to reach the gas pedal.